New York Times bestseller Lauren Myracle's long-awaited prequel to Eleven! Winnie Perry is turning ten and ten is BIG. It means double digits, more responsibility, and being an almost-middle-schooler. Ten means that Winnie can handle anything, even a three-year-old baby brother and a practically teenage (and acting like it) older sister. And with her best friend, Amanda, by her side, Winnie plans on enjoying every last second of her last year in grade school. Ten was very believable and I felt like Winnie was real, between trouble with her family and at school Winnie was great. Lauren Myracle is a star! 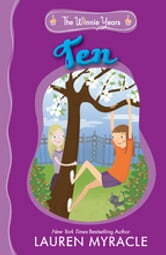 Ten is one of my fav books! If you likd ten u should read eleven twelve thirteen and thirteen plus one all by Lauren Myracle!